Meet OptiGrill+, our ultimate innovation. Its “Automatic Sensor Cooking” technology immediately detects the number of items placed on the grill and their thickness, and adjusts the temperature and cooking time automatically. An indicator light allows you to monitor your cooking directly: Blue then green at the start of cooking, then yellow when the food is rare, orange when it is medium and red if you like your food well-done. For peace of mind, you can also use the new manual mode and adjust the temperature of the plates in order to match your tastes perfectly. 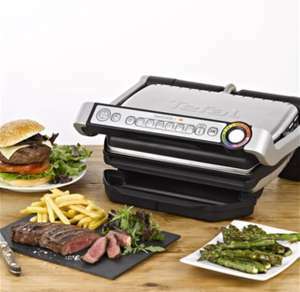 OptiGrill™ by Tefal®, for successful grilling all year round to satisfy all your friends and family every time! • 6 cooking programmes (red meat, poultry, fish, sausages, hamburgers and sandwiches/panini or bacon) to automatically adapt the temperature to each type of food and cook it perfectly. • 2 cooking modes: one for frozen food, plus a new temperature control that lets you cook anything the way you want. • 600cm2 cooking surface (capacity 2 to 4 people), with non-stick die-cast aluminium plates. • Large juice tray and 7° angled plates to ensure the cooking juices run off. I agree, no history of selling anything then has 20 new Optigrill XLs to sell at 20%+ below the market price. You pay your money thinking you are protected by paypal, then you lose your money. I agree, no history of selling anything then has 20 new Optigrill XLs to …I agree, no history of selling anything then has 20 new Optigrill XLs to sell at 20%+ below the market price.Plus Liverpool, enough said.You pay your money thinking you are protected by paypal, then you lose your money. Hang on, “plus Liverpool”? I’m from Liverpool and it’s a great place.